I’ve uploaded the cover for Second Chance along with some teasers of covers I liked for potential future volumes. Hope you like! Well I’ve just joined up to participate in this years Camp NaNoWriMo. I’ll be working on a separate project, Second Chance, leaving A Thousand Hearts to its usual schedule. This is the first time I’ve done anything related to NaNoWriMo and I’m looking forward to it. So a little bit about Second Chance. It’s a slightly different type of book to what I’ve been writing previously, focusing on the romance storyline more than the adventure. The basics are that a guy saves a girl, the guy dies in the process, but his spirit is left behind. I’m looking forward to writing it, and hopefully the end result will be as interesting as what’s in my head right now. Well just a quick update to let you know that after a fair few set backs and hurdles that have distracted me from knuckling down on my second book, A Thousand Hearts Fallen is now 25% complete! Hopefully I can now get back on track and get the book completed in an orderly fashion. Wish me luck! Well it’s the second day of my free promotion running on Amazon and so far things are going well. Seems to be plenty of people out there who like the look of my book. Thanks for your help, and if you haven’t picked up a free copy yet, then get downloading. I’ve recently opted in to Amazon’s KDP Select programme and this weekend is the first promotion! So what does that mean for everyone? Well it means you can grab yourselves a copy of my first novel, A Thousand Hearts – Rebirth, absolutely free of charge! The promotion will last until tomorrow evening so spread the word. Would love to power through the Amazon rankings this weekend. Posted on May 31, 2014 October 30, 2015 Categories News, Writing, Writing NewsTags amazon, free ebook, kdp, selectLeave a comment on Free eBook on Amazon! Good evening all. Since it’s bank holiday here in the UK I thought I’d kick off a little sale until Monday evening. Grab yourselves a bargain, with A Thousand Hearts – Rebirth, retailing on Amazon at a only 77p! For those outside of the UK the sale extends to you guys as-well! There’s no better time to buy, so pick up a copy this weekend. 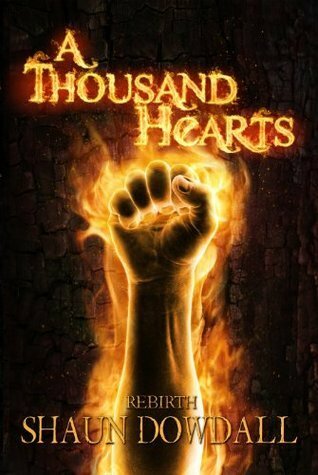 Thought I would experiment on Goodreads so I’ve put an autographed copy of A Thousand Hearts up for grabs! Not sure what sort of demand to expect but thought it could be a fun idea. If you have a Goodreads account then check it out, who knows, you could be the winner! Giveaway ends May 26, 2014. With a recent little push from Amazon, A Thousand Hearts – Rebirth, has begun climbing in sales once again. So I decided to support Amazon’s efforts by running a promotion/competition myself. The more shares, and visibility we can get the better! For anyone who shares or helps spread the word your name will be entered into a prize draw. The winner in the UK will receive a signed copy of my book, A Thousand Hearts – Rebirth, and the winner outside of the UK will win a free copy in eBook format. I’ll be running this campaign over the weekend, drawing it to a close and announcing the winners on Monday 19th. So to be in with a chance to win, just share, reblog or repost this message and let’s get as much interaction as possible. Thank you so far to everyone who has supported my first book launch, this weekend I’m really driving to get the book into the top sellers league! Well it’s almost been a month of being published and so far so good! Feedback from the book is great, glad everyone who has read it has been enjoying my story so far. A Thousand Hearts broke into the top 10k selling books, not sure if that’s a great achievement in terms of sales but I’m pretty happy considering the huge number of books selling out there. As always, if you haven’t checked out my first book yet, take a peek at the following links! The plan for the second book in the ‘A Thousand Hearts’ series is complete. Writing will begin today and my schedule is jam packed with time planned for writing this book so expect a faster turn around! The title for the second book is ‘Fallen’, focusing on a new era for the Guild and it’s members. As always I’ll keep updating you on the progress of the book but for now here is a little teaser image! With the launch of my first book quickly approaching I’ve created a little bit of marketing to hype it up a bit. This is the first bit before the wave that should be hitting within the next week. Well, I must admit, that in all the mayhem leading up to the book launch I forgot to actually announce it! My first novel, A Thousand Hearts – Rebirth, will be landing on virtual shelves within the next two weeks. I’m very excited and can’t wait to get this book out there. Hopefully I’ve learnt a few things, following a number of different processes and gaining new experiences. I may have even learnt a few things about how to actually write thanks to a very, very, patient editor. So thanks for everyone’s patience so far. Not long now. Another little doodle I did of Michael Nolan and Katerine Lesigne from A Thousand Hearts. Had some great fun playing with this on my Galaxy Note. Not long now until the book is out! Just a couple of weeks. The book is now being formatted to fit ebooks and also print. Once I’ve got the completed files back it won’t take me long to get the book out. The wait is almost over.